Your job involves developing educational material for young children. What should parents and schools look for when buying educational products? They should buy educational products that offer value and quality and can assist a young child to want to play and explore their world. Colours, numbers and shapes are three critical elements in the learning process for a young child. A child and the parent should play, talk and explore the world around the home and community. The first time a child learns a new concept, it should be taught in isolation to ensure understanding. How important is early childhood development and how can parents help their children become school-ready? School readiness starts at birth and the parent is the primary educator. The brain pathways are built through movement, songs, language and playing with your child. Strong pathways will ensure that your child is ready for formal school. New research is indicating that the window of opportunity for building strong pathways happens very early (before the age of three). What toys do young children need? Children need to move around and explore their world. They need to crawl, run, hop, skip and jump and move around as much as possible. Games like puzzles, memory games and card games are wonderful tools to help them learn. Reading to your child from birth is one of the best gifts you can offer them. A confident child who loves reading has the world as their oyster. The most important element is you the parent engaging and playing with your child. What do you do at the Refirement Network? The Refirement Network is looking at the Baby Boomer generation (those born between 1946 and 1964) who are now in their late 40s to mid-60s. Medical technology is keeping us alive longer and keeping us younger for longer. This means that we should not stop work, sit back and do nothing. This generation has wisdom and knowledge that can be used in South Africa to help grow our economy. Through the Refirement Network I encourage older workers to discover their passion, use their skills and wisdom and help to bring about change for our nation. This does not mean working full time but in cycles of work and play, doing work such as acting as mentors, coaches, business incubators and social innovators. Is your work with young children and older people very different or are there similarities between the two roles? The work I am doing at BrainBoosters is my own Refirement career. 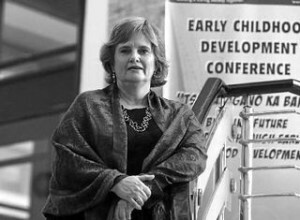 I spent the first 25 years of my career in the development of early childhood materials and building a network across South Africa. I am now helping to build a social enterprise where we are helping to change the lives of children by engaging with parents in the workplace. I love working in the field of transformation and development and both young children and older people are using new technology and understanding to be equipped for the 21st century. We live in changing times and it calls for a different mind set. There is a general sense that our concept of age has changed. Have you found that people are open to the idea of retired people rejoining the workforce or is there resistance to it? The world of work is changing and the secure workplace of the 20th century no longer exists. There is resistance to older workers who are not equipped with skills needed in the current marketplace. Whether you are young or old the world of work is about the supply and demand of skills needed contract by contract. I try to educate both the employer and the older worker of the opportunities that are available. What are the most important skills that retired people can offer the economy? There are a number that come to mind – entrepreneurs, teachers, coaches, mentors, carers, early childhood educators, artisans, social innovators and tour guides. In every community there is a need for volunteers to help. Offer your services for free in the beginning and you will be surprised at the opportunities that may arise. Money is not the only currency as we grow older; meaning can go a long way to make you feel better about your circumstances and is good for your health and the community. I have always wanted to be in business. I come from a family of entrepreneurs and have spent most of my life seeing opportunity and developing and growing my skills. We are never too old to learn new skills and I continue to learn new things and this opens my mind to new opportunities. In 2009 I did a social entrepreneurship certificate at the Gordon Institute of Business Science. This course helped me to design and build BrainBoosters. What about your job do you love the most? Helping people grow and develop is such a privilege – giving a child the opportunity to have a changed life, the light going on for a parent who takes responsibility for understanding their role or helping an older person navigate a second career that can bring change to a community and their life. What would you like to change about your job? I see so many opportunities to help bring about change and there are not enough hours in a day to do all the things I would like to do. We have six million children in this country under six and we need to help them enter the school system ready and equipped. I wish more business owners understood that the talent they need in the workplace in the future can only emerge if we all take responsibility for starting the process early. What is your favourite time of day? I live at Hartbeespoort Dam and I love the early mornings. I get up early, make coffee and sit and read my Bible and pray to prepare me for the day ahead.